(MoneyWatch) Everyone's been wondering whether the economy and stock market might repeat the pattern of the last two years -- a cycle of stock bullishness, followed by fears of slowdown, panic, central bank action, and recovery. This week, the Fed and data on economic growth (GDP) and housing might provide investors with more clues to help answer the question. This week's Federal Reserve FOMC meeting is not expected to be all that interesting, with no change likely to current monetary policy. 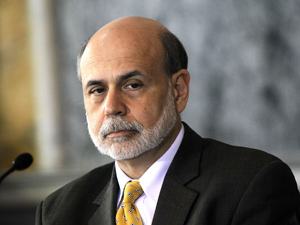 But Chairman Ben "I'm all about transparency" Bernanke's press conference could reveal what Fed officials are considering in the future. The press briefing will kick off with the summary of central bankers' economic projections. When the Fed released its first-ever quarterly forecasts in January, it saw unemployment remaining too high for years and inflation to be at or below the Fed's target. Not too much changed at the subsequent FOMC meeting in March, where "several members continued to anticipate, as in January, that the unemployment rate would still be well above their estimates of its longer-term normal level, and inflation would be at or below the Committee's longer-run objective, in late 2014." Some Fed members have indicated that the central bank would consider additional asset purchases (QE3), if the economy lost momentum or if inflation seemed likely to remain below its mandate-consistent rate of 2 percent over the medium run. Since then, the jobs picture has darkened a bit (March saw the creation of just 120,000 new jobs and weekly data has been trending down over the past few weeks); regional manufacturing data has indicated a slow-down; and worries about European debt have resurfaced (Hola Espana!). Market and econ-watchers are eager to hear Bernanke's view on those risks and whether the committee is now actively considering further action. In other words, the world wants to know if QE3 might set sail at the next meeting in June. One rationale for additional easing would be a slowdown in growth. GDP for 2011 was only 1.7 percent, but the fourth quarter saw an uptick to 3 percent. With the Eurozone in recession and China reporting a three-year low in growth of 8.1 percent, the first reading of U.S. GDP for the first quarter is widely anticipated. Estimates are for an increase of 2.5 percent. One of the major drags on the economy continues to be housing. This week, data on home prices and new home sales are likely to confirm what everyone knows: The market stinks, but it is slowly attempting to find a bottom. The market is still plagued with too many sellers and not enough buyers and distressed homes are keeping a lid on prices. Homes sold as foreclosures or short-sales accounted for 29 percent of March sales, according to the National Association of Realtors. Until more data confirms or denies the extent of the slowdown, investors are likely to experience see-saw action, like last week's. The Dow and S&P 500 snapped two-week losing streaks, while the NASDAQ was down, due in large part to the 12 percent weight of Apple within the index. Apple slid 5.3 percent on the week and has officially corrected 12 percent from the intraday high reached on April 10. The stock remains up more 43 percent this year.